What I liked most about this book was the eclectic nature of the selections, which encompassed everything from classic fiction to non-fiction to graphic novels. Many of the titles you'd expect to see were present, but there were also a number of books and authors of whom I'd never heard. Perhaps there was a slight slant towards American history on the non-fiction side of things, but that aside, it was a broad selection of literature from around the world, and I would defy anyone not to find something that interests them within the picks. I came away with a list of around 55 books I would like to read in the future. 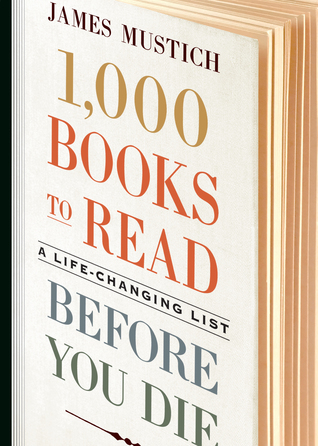 Although the title is 1,000 Books to Read Before You Die, there are actually more than 1000 recommendations when you factor in the additional notes attached to each book. There is even a handy checklist at the back, so you can tick off the books as you read them. All in all, this is a thought-provoking selection I would recommend to anyone looking for their next great read. A solid 4.5 stars from me.